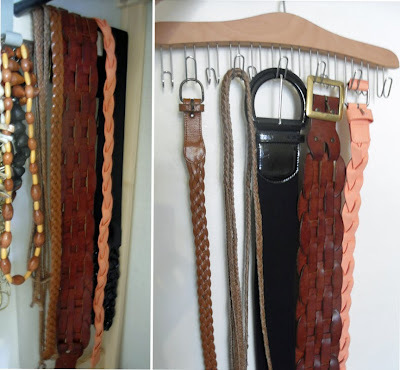 B U B B L E G A R M: How to store your accessories! How to store your accessories! I store my earrings in an acrylic divided box from Muji, I coordinate them by colour or style. It's very easy for me to find something that I want as I can see everything properly. It has a sliding lid to protect it from dust, I just sweep this box under the bed. Or, you can hook your earrings onto a glass, mug or vase and display them on your dressing table. I store my necklaces hooked onto these inexpensive little hooks from Ikea, I currently have a canvas wardrobe so I have quite a few wooden panels to hook things onto. However, you can hook these hooks onto the inside of your wardrobe door, so once the doors are open everything is clearly displayed but out of the way. Or, if you have drawer space you can lay your necklaces all neatly in a row. Furthermore Muji also do lots of various acrylic dividers, you can pop your necklaces into those. A way to store your rings is hooked onto a hoop earring, none of them go flying around. I have currently just popped my bracelets into a box which slides under the bed. Or, If you have drawer space, you can pop all of your rings into a box and even display it on your dressing table. 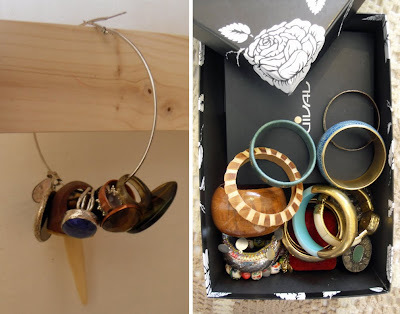 You can also store your bangles neatly in a row, I do this by popping a circular cylinder shape inside them, you can use the inside of a kitchen towel or in my case I had a pretty olive oil box that I saved. I folded mine up and displayed them upright into a cardboard box that was sent through the post with some clothes in it. It's amazing what you can do by recycling. You can store this in a drawer or even slip it under the bed. Or, you can get a scarf hanger and slot them all in, however I find that this gets quite bulky and takes up more space than the folded option. It's nice to have your bags all laid out but it takes up too much space, I got this fabric cream box from Ikea. I folded the bags neatly and put them inside. I just pop these inside the cupboard. However, I find it's nice to have a nice chest at the end of the bed or in front of a window to store bags in. Currently they are placed neatly on a little shelf in the wardrobe, nothing special about it. I sometimes overlap the shoes - but that's quite obvious so didn't feel the need to show you a picture. When I had the space, I would either store them in a shoe cupboard or a chest. ha Men, they don't get anything..."Cluter" you kna! I love the mug for earings idea...so cool, will be stealing it, hehe! Shirls...like you call me lol! This is such a great post, I am so envious of how neat and organised you are! I have dreams of de-cluttering my room and sorting everything out, but I am way too mussy to impliment it! I'm having trouble with my dress jewelery getting tarnished lately, any ideas how to stop this? This is awesome. I never thought I had enough space in my closet. I guess I have to do this to make up some more space for new clothes! LOL! THX! such good ideas, great post! This is actually very helpful. I store my accessories in a drawer. But I like the acrylic boxes. Dunno where I can find one here but I'm gonna try dunelm haha. Those hangers are so cool and just what I need. This post could not come a better time for me, because I really need to organise my jewelry better. I love the idea for using the glass for earrings. I am going to try it out today. You are a lifesafer :-). Jewelry is a bit of a challange to keep organised without looking cluttered, but you done the opposite. This has so made my day. Thanks a bunch. I love the jar and the earrings idea. These were soo helpful! Currently mine are hanging from a memo board with ribbon across but I tend to find it difficult to get a hold off since it has to lean on the wall behind my dresser. Thanks for the tips! great storage ideas. i am going to have to give some of these fabulous tricks a try-especially the ring storage. I store my dangly earrings on my bedside lamp like yours on the glass, it makes pretty colours around the room when it is lit! Some great storage ideas there! Thanks for sharing your tips!! This was a very helpful post-thank you! I love the idea of hanging the earrings around a cup, i never would have thought of that. I just wish there was a muji where i lived! I like the necklace idea with the hooks cos then u can see them all clearly and the chains dont get tangled. my necklaces are all over my room. So's my make up actually. its so darn annoying. Fab, fab post. My jewellery gets cluttered all over the place, or the pieces get all tangled up with each other. These are v practical, doable solutions. Great ideas! I especially like the options for scarf storage. They always get buried in the bottom of a drawer or closet therefore I can't find them when I actually need them! I was wondering about the way you store your scarves. I know if I pulled one out it will mess up the other scarves. Do you put cardboard inbetween the scarves? Looks like I may have to make a trip to IKEA for hooks and containers. I really like the one you used for the handbags. 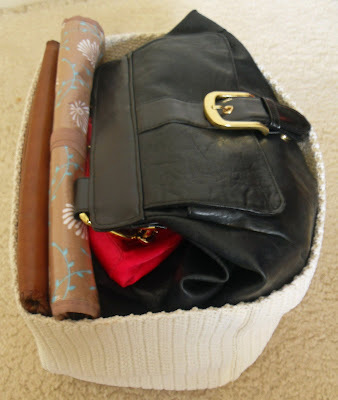 I use a fabric container for my handbags. Its bright pink, I like yours better. Great tips!! 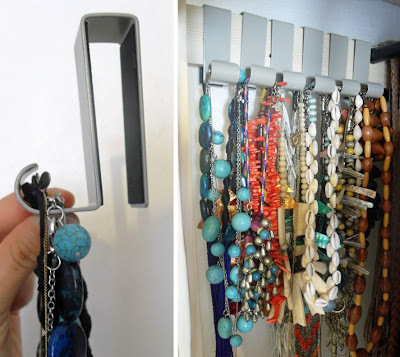 I like the idea of hanging necklaces from a peg board.. I didn't think of that... thanks! I find it easy enough to store my makeup but jewelry is one thing I can never seem to organise. I HATE my necklaces tangling together so much! Best blog post ever. I need to sort my room out as the man in my life is starting to moan. I hang my necklaces on a statue thingy and it takes me ages to get them off. I love your hook idea but my cupboard doors are sliding. I might just get that box from Muji and put them in individual boxes. @Rhamnousia muji has fantastic stuff, those divider boxes are amazing! Thanks a ton for that tip about storing earrings by hanging them on the edge of a cup or vase.I have exactly the same glass vessel and I have don all my earrings on them neatly displayed on my table!! @Pg yay :) that's great news, your welcome! Yes! Finally someone writes about dishevelled.